PharmaShop24... "Always there. Always open." 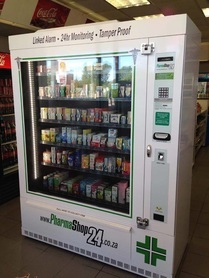 PharmaShop24 is a fully automated health care product dispensing machine that provides a 24hour service to Shell - Oranje Dienssentrum Aliwal North customers. It provides convenient and discreet all hours shopping from a wide range of health care products. Products range from baby and childcare, nasal care, oral care, cold and flu, adult, unique OTC products and woman's health. It is easy to use. Come and visit us and see for yourself.